Greener building in Chicago: Insulated foundation. Building green from the ground up. 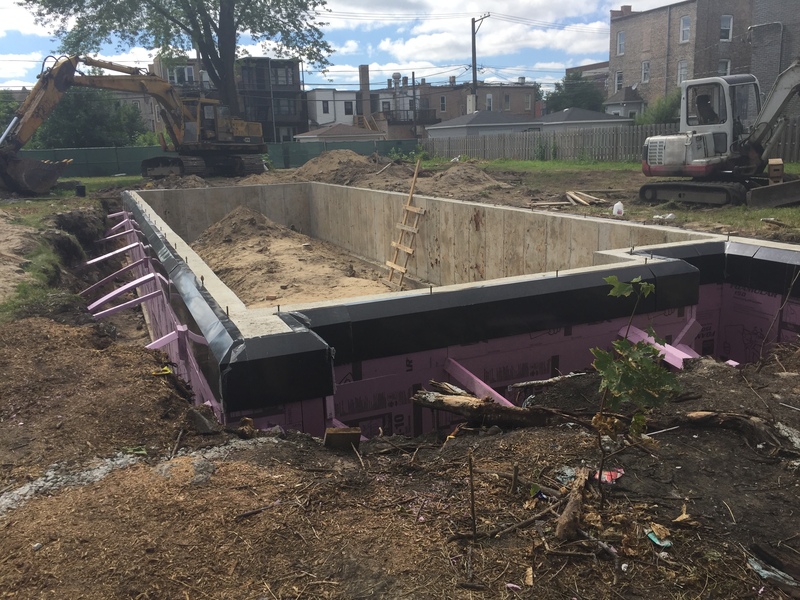 This is the second installment covering the progress of two affordable high performance luxury homes being constructed by two of Chicagoland’s greenest homebuilders, Greenline Homes and Brightleaf Homes. Today, were exposing what’s under the dirt. This is one of the features you don’t see when the home is completed, the foundation. ABOVE: Insulated Foundation of 4516 South Prairie (Greenline Homes). Note the pink foam insulation panels added against the sealed foundation walls prior to backfilling. BELOW: A more conventional foundation without insulation. The lack of insulation is evident and the builder has simply applied sealant to the surface of the foundation. One of the first considerations when building a new home is the foundation. 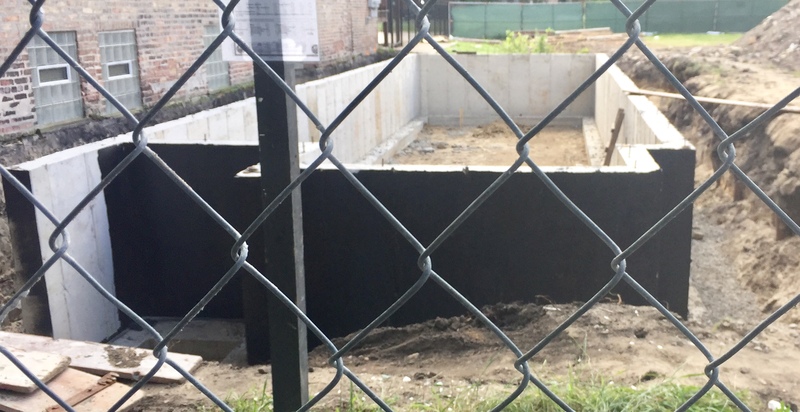 New construction homes in the Chicago region are typically built with full height basements constructed of reinforced concrete foundation walls, set on top of deep reinforced concrete footings. After they are cured, sealant is typically applied to the exterior prior to back filling and a vapor barrier is typically applied below the slab prior to pouring the floor. These foundations are a substantial improvement over the porous stone and brick foundations of the past and offer the opportunity for high quality, finished space below grade. 1. It saves money and energy. An insulated foundation reduces heat transfer between the heated interior of a home, and the ground. Typically the ground temp is lower than the heated spaces in the home, so heat transfer from the interior to the ground is constant and increases the amount of energy consumed to heat the home. In a climate like Chicago, where we heat our homes 7-8 months per year, this save energy and dollars. 2. No more musty basement smell. When warmer interior air, that is typically 73 degrees, comes into contact with an uninsulated foundation wall, typically 55 degrees, condensation is likely to occur on the warm (interior) side of the wall. This moisture creates a perfect climate for mold and other microorganisms to flourish, especially with a finished basement where there is paper faced drywall in close proximity to this source of moisture. Insulating the foundation keeps the foundation walls warmer, eliminating the possibility of condensation, creating a healthier, and more pleasant space. 3. No more cold feet. When insulating a foundation, the floor is also insulated. This increases the temperature of the concrete slab, making the floor more comfortable to the touch than an uninsulated one. In many homes, radiant floors are installed as a luxury feature and insulating under the slab keeps more of the energy used to heat the slab in the home. So why doesn’t everyone insulate their foundation? Simple, it costs money and it’s not required by code. When shopping for a new home, this is a very important feature to consider. It costs very little to do, but has a very good return on the investment in the life cycle of a home. Next up, we’ll discuss building envelope and air sealing. Please follow our progress and like my Facebook Page.